According to a new report North America Temperature Sensor Market, published by KBV research, the North America Temperature Sensor Market Size would witness market growth of 5.4% CAGR during the forecast period (2018-2024). The US market dominated the North America Bimetallic Temperature Sensor Market by Country in 2017. The Canada market is expected to witness a CAGR of 6.7% during (2018-2024). Additionally, The Mexico market is expected to witness a CAGR of 6.4% during (2018-2024). The Chemicals market dominated the Canada Temperature Sensor Market by Application in 2017, growing at a CAGR of 6.2 % during the forecast period. The Healthcare market is expected to witness a CAGR of 6.8% during (2018 - 2024). Additionally, The Consumer Electronics market is expected to witness highest CAGR of 8.8% during (2018-2024). The market research report has exhaustive quantitative insights providing a clear picture of the market potential in various segments across the countries in the region. 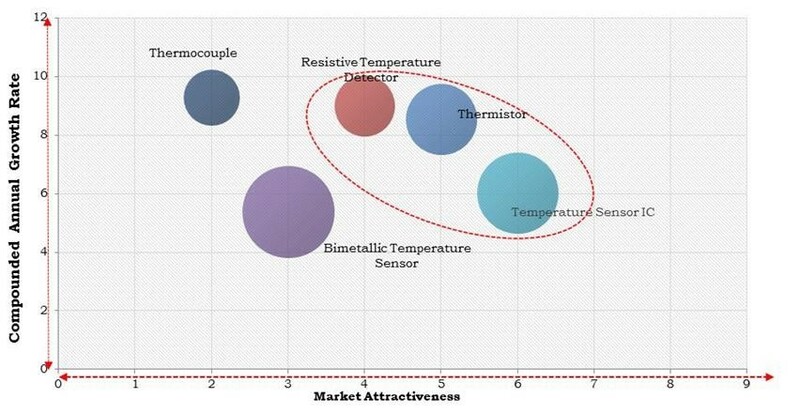 The key impacting factors of the North America Temperature Sensor Market have been discussed in the report with the competition analysis and elaborated company profiles of ABB Group, Siemens AG, Emerson Electric Co., Texas Instruments Incorporated, Honeywell International, Inc., Microchip Technology Incorporated, NXP Semiconductors N.V., Maxim Integrated Products, Inc., Analog Devices, Inc. and On Semiconductor.